The folks at Jefferson Area CHiP found a way to put the fun back into fundraising. 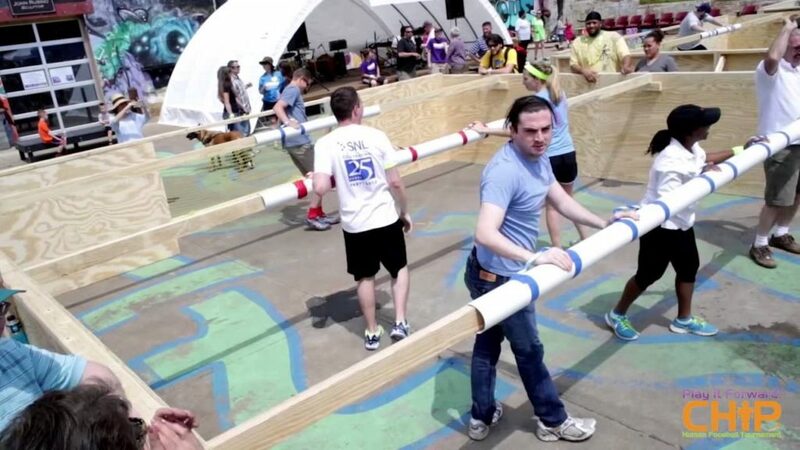 Molly Fulton, CHiP’s development director got the creative idea for a Human Foosball Tournament when she saw a Facebook post about someone’s backyard court. The third annual tournament takes place on Sunday, April 23 at Ix Art Park, 1-5 pm. Teams pay to play, but spectators get in free. And for CHiP, making friends is a big part of the plan. The Foosball action takes places on four courts, and games run throughout the afternoon. Along with the friendly competition, there will be food, beer, music, and face painting. Volunteers are needed to keep score, referee, chase balls, and assist with parking and registration. For more info, contact Molly Fulton at 964-4708. CHiP stands for Child Health Improvement Program. Jefferson Area CHiP helps families raise healthy kids through visits with families in their homes. Come to the tournament or visit CHiP’s website to learn more.